Should is just another word for obligation. The answer to all the following questions is NO! Should I keep this in case I need it some day. Should I keep this because (fill in the blank) gave it to me. Should I keep this, even though I have more of them than I need, just in case one day I actually have to cater to a much larger group than I normally would. Should I keep this because someone made it for me. Should I keep this because, after all, everyone has one. There is no should when it comes to decluttering. Should implies that you are giving your right to choose away to someone or something else. It is up to you entirely as to whether you find something enjoyable or useful enough to warrant a place in your home. It is your home after all, your sanctuary. Should the giver, society, mistrust in the future or other external influence have any say in your decision to keep something that you, if having asking such questions, don’t really want. Would you keep the item without these obligatory attachments to them? If the answer is no them let them go. Haha, indeed!! And don’t forget: Should I keep this because it was expensive? Yes Naigaru, those expensive items are a trap. I find that items that were once very useful to me but aren’t any more to be a challenge to let go at times. Simply because I am grateful for their years of service. I love the idea of getting rid of the “should” clutter. The biggest ones are the family items. I think I am going to finally give away a watch that simply sits in a box in the closet this week. I will let you know how it goes! Tony – good to see you back! Enjoyed your posts on living light out at camp. Good luck Tony, I hope you find the strength to let it go. “Should” clutter is one of the things my mother has the hardest time getting rid of. I understand in a way because I know she was raised during the depression and WWII when their was either no money to buy anything with or when they had to have certain stamps to buy it. But, we are no longer in that place. While we don’t have lots of money to spend we also aren’t using the things she is having a hard time getting rid of anyway. We are working on this and she seems to be getting better at it. Deb J – a couple of months ago I put my family on a budget so we could save more and what was interesting was that straight away I struggled to get rid of ‘what if’ items. Suddenly some programme called ‘Hold Onto It’ downloaded in my brain and it was a bit of an effort to push past it. I guess when people went thru major economic trauma like wars and the depression its got to have a big impact, I only set in place a budget and I have had two years of 365 Less Things education prior. LOL. I had to have a lot of ‘chats’ with myself (yes I admit to talking to myself again) and gained some insights into how/why I reacted that way. Recently I saw an interview on Midway Simplicity and he spoke about his 20-20 rule (which I thought sounded catchy) if a ‘what if’ can be replaced for under $20 and under 20 minutes its ok to let it go. I really liked that. For some reason saying ‘The 20-20 rule” seems to neutralise the ‘Hold Onto It’ programme for me and as I have in my budget a contingency amount each week which would more than cover it if it beomes dire that I replace whatever, then it ok. I used to be a just in case person. I especially dealt with “what if I can’t find it anymore?” Then I realized that I had picked that up from my parents. So I had some of those talks like you and started kicking it to the curb. The 20/20 idea has merit. That wouldn’t work with Mom. She thinks that if it would take ANY money to replace it that it should stay. Oh, Deb J., I grew up in a household where both of my parents lived through the depression years as children. It really impacted my Mom’s way of thinking (still does), however, my Dad successfully moved passed it and created a beautiful life for his ‘ohana (family). I have taught my adult daughter that this is “scarcity thinking”, not having faith that God or the universe will always bring you what you need, not necessarily want. We have named it Mr. Justin Case for anything that fits into this category. I agree that “scarcity thinking” is what is happening. “Mr. Justin Case” is a great name for it. Kimerley – scarcity thinking – I really really like that! I like Mr Justin Case too but scarcity thinking really sums up the ideal. And yes, must keep faith that the sun will rise whether I have a Tupperware Thingamee or not. Deb J, I just realized that I responded to your comment under Moni’s comments (which were excellent too). 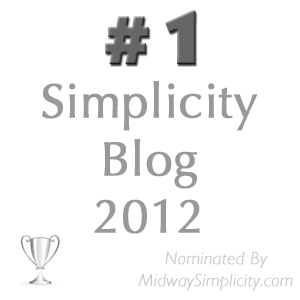 Loved Midway Simplicity’s 20/20 rule post too, Moni. Kimberley – I was quite inspired by the 20/20 rule post, was hoping that Colleen would use it here for that weeks Friday Favourites but she already had plenty that tied in with that week’s theme. I’m not usually a huge fan of that particular guests blog – not because I don’t agree with the message or their perspective, I just prefer a more chatty post, and I don’t always get to watch the interviews on Midway as I am usually at work when they come in. So it was almost cosmic coincidence that I actually watched it and was really buzzed about it. Hi Deb J, getting it through to her that these things will never be needed by you again even in hard times is the challenge. Knowing the difference between need and want is key to decluttering. For example – I need this pan to make a certain type of cake. The reality is that we dont need specialty cake so we dont need that pan. You are right, Colleen. But trying to get that through to Mom is hard. Part of the problem is that she is struggling with the fact that she can’t do the things she used to, that we can’t afford to be quite so generous with giving goodies, and that she wants money for everything. I did finally get her to agree to just let me take all this latest stuff and give it to the Women’s Shelter as a tax write off. Opinion please everyone: I have a small box of children’s toys that recently relocated from our ceiling storage to our hall cupboard. There is plenty of room in our hall cupboard. What I realised is that when one set of nieces come over they want to do nail polish and watch dvd’s (they’re a bit older), hang out etc – when the other set of nieces and nephews come over I get these toys out, but we tend to go and see them as they have a baby and its easier for them to put the little ones to bed. So we probably have them over maybe 3 times a year. They didn’t seem that excited when I brought the toy box out last time and I’m thinking it might be time to ditch the toys and when I invite them over, grab a couple of cheap colouring books from The $2 Shop. What do you think? My DH was just reading over my shoulder and weighed in. He thinks you should offer the box of toys to the children’s parents. His grandson recently stayed with us, and DH sent him home with some Lego toys that were in his office. Moni, this fits into the Mr. Justin Case category, too! Ask the kids if they want to take them home with them next time they come for a visit. I would bet that they bring their own “entertainment” with them when they visit. Let it go. I agree Kimberly. Moni, my advice is to let them go and just make sure the patents are aware you no longer have toys to entertain them with when they come so they should bring their own. Get rid of the toys and get the coloring books. Everytime they come and color put their names and the date on the pages they color. Tell them this is so you can see their progress from visit to visit. Deb J – at $2 each for the older two with a $2 pack of crayons chucked in, 3 times a year, they would be taking it home with them! I could always download a game onto the ipad for them, though I’d have to give some thought as to how to allow them to use it without it getting wrecked. We won the ipad and its a rather treasured piece of technology in our household. I’m learning to keep electronics away from visiting children. Some are very careful and others are not. So I just don’t even have it where they can see it when they come. We only saved a few toys of our kids–legos, building blocks, some books. When the grandchildren came along, I bought some toys at garage sales now and then. When we babysat they played with them until they were 7 or 8 years old. The legos never got played with (probably had newer, fancier ones at home). However, the building blocks did get played with–by the boys. The youngest is 9, so we have decluttered most of the stuff. Coloring books sound like a good idea, or even just construction paper for them to draw on. A few picture books are usually liked as well. Offering what you have to the parents is a good idea–unless you would just be cluttering their house. .
Years ago me, my husband, & our 4 kids were living in a very large city, several hundred miles away from any family. We lost our car, & then we had out utilites turned off in mid-winter, etc, etc. After we got back to our home town, I turned into a hoarder, scared to not keep everything, justin case. It was a couple years later that I was finally able to start letting go of a few things. And then years later, when my mom passed away, & I realized all the belongings that she’s held on to—well, I’m not gonna leave a mess like that for my kids to cope with when I’m gone! And I try to not bring extra stuff into my life. and continually going thru stuff & getting rid of more. Life is so much better!! Jane – wow! I can understand the trigger of harsh economic times setting of a hold onto everything mentality. I realised very recently my cluttering years stemmed from a hard financial time in our lives and the guilt I felt at the time that the kids were going without or that the future of their extra curricular activities was in jepodary not so much from the fees but the cost of supplying gear, so I started trying to stay ahead and prepare for all eventualities for them. Silly me. And it just sort of spread from there. Of course, not all the clutter related to them but it seemed to be the starting point. Our lives improved substantially when we let go of our shoulds, and not just in regard to decluttering. Michelle, this is great. I love it.